SOS Brings Back Straight Ticket Voting And That Brings The R's Into The Courtroom, Plus; Media Starts For Southern Congress Race, And: Hard Feelings Between UNM And Santa Fe? Straight ticket voting in the state is thought to most benefit the Dems because there are more of them and their voting base is not as motivated as the R's. 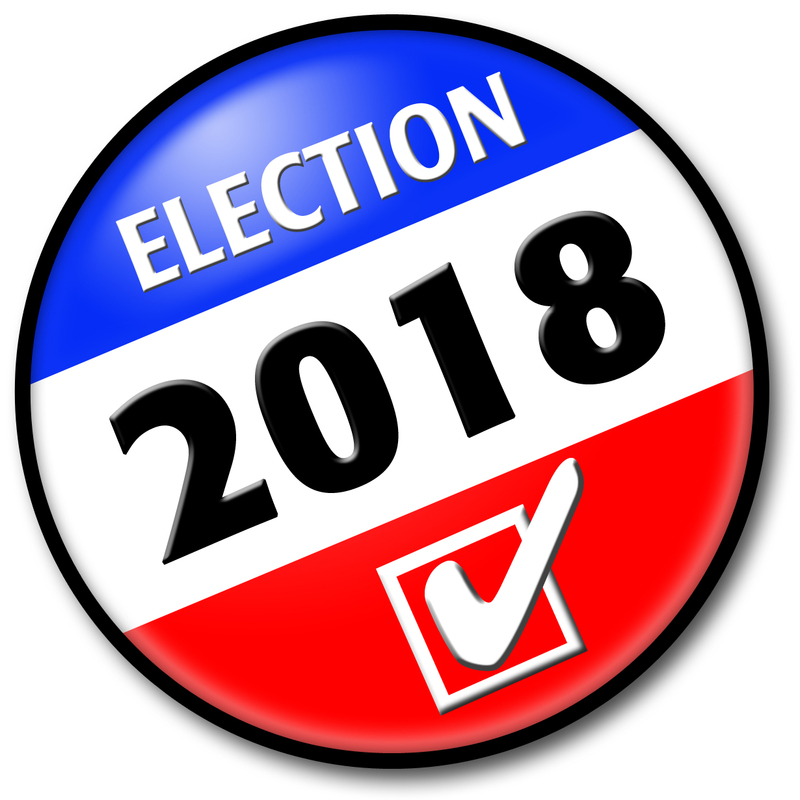 Political analyst Steve Cabiedes says the Dem candidates who would most benefit are in the down ballot races where voting drops off significantly from the top races such as Governor and Senate. Straight ticket voting is an attempt to rig the system in favor of Democrats and turn New Mexico into a one-party state. The Secretary of State’s announcement is a blatantly partisan effort to that will unfairly benefit her own re-election bid. The legislature outlawed straight ticket voting in 2001 through a change in election law. The hasty attempt to bring it back is likely illegal and we will take appropriate legal action. By waiting this late in the election cycle to make this blatantly self-serving decision, Toulouse Oliver has shown that she is incapable of serving as both the referee of this election and a participant in it. I am committed to making it easier—not harder—for New Mexicans to vote. From moms juggling work and kids to elderly veterans. I'm not a fan of straight party voting. It’s not a mater of voter convenience; it’s a matter of partisan advantage in low information elections. Our country needs less vicious partisanship, not more. As for the charge that the voting change would benefit her own election, Toulouse Oliver is a runaway favorite for re-election. And the state GOP shoulders some of the blame. ABQ Attorney JoHanna Cox was their nominee in the June primary but was forced to withdraw when it was reported that there were three malpractice lawsuits pending against her. Then the R's named Gavin Clarkson, a onetime Trump appointee as her replacement. A male Trump appointee going for a position that has been held exclusively by women for decades? And the Libertarians had political gadfly and former Dem State Rep. Sandra Jeff as their SOS candidate for a while before she called it quits. Come on, guys. Let's get serious. Meanwhile, In Dona Ana County the top voting official there--County Clerk Scott Krahling--abruptly resigned as word spread of an ongoing investigation into an unspecified complaint against the Clerk. The County Commission will name a replacement as Krahling heads for the exits and the Dems hope he takes any embarrassment with him as the campaigns head into Labor Day. A reliable source in Cruces gives us the scoop that the probe involves Krahling's relationship with former Chief Deputy County Clerk Rose Ann Vasquez and their expenditure of office funds. Signs of life in the battle for the southern congressional district are being seen as Dem hopeful Xochitl Torres Small comes with the first TV ad in the race in which she is up against GOP State Rep. Yvette Herrell. I’ve spent my career working with New Mexico farmers and ranchers, protecting water and the water rights they depend on. Like federal drought legislation and funding for new conservation methods. . .I believe good ideas don’t come with a party label. I’ll work with anyone who wants deliver for New Mexico. Interesting. Does working with "anyone" include President Trump who remains popular in the district, especially on the eastside and in rural areas? 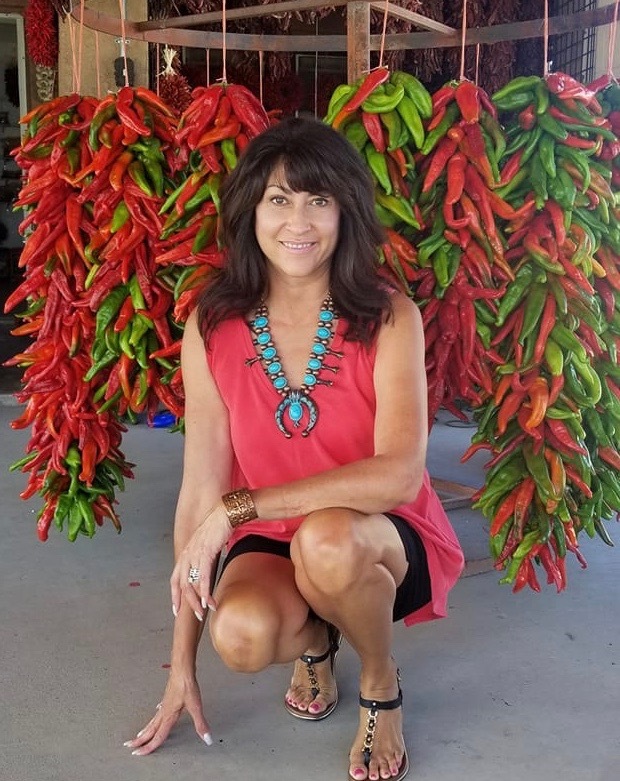 Torres Small, a water rights attorney making her first bid for public office, has a fine needle to thread in trying to appeal to a broad spectrum but she is off to a quick start in her fund-raising and has beat Herrell onto the airwaves. Also, she is a fresh face who comes across well. The DC pundits have moved the race from "Likely GOP" to "Lean GOP." They and everyone else are waiting to see some fund-raising muscle from Herrell who depleted her treasury in a heated June primary battle with Monty Newman. Torres Small, 33, had a cake walk in the primary. 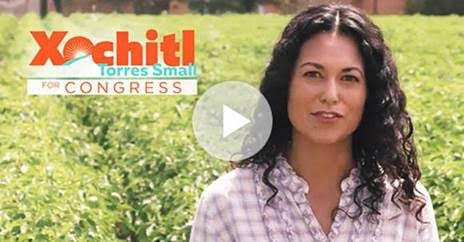 If she raises ample funds Yvette's job will be easier than Xochitl's. She will not have to look for many votes outside of her natural base. There are plenty of R's, conservative D's and independents for her to appeal to. One other note: Any TV debates between this pair should be worth watching. Both are smart and politically agile. The (comments)y were made by Mr. Arellanes in his capacity as Chair of the Hispano Round Table. He has every right to make these comments, and I do suspect that the majority of LULAC's membership would agree with him, as would I, personally. However, it is important to LULAC that attributions not be made to us that are not properly attributed to our organization. The chairpersons of Hispanics for Pearce said they were proud to stand with him against “false attacks.” “This ridiculous attempt to smear Congressman Pearce is extremely disappointing and demonstrates the high level of panic among the far left as Congressman Pearce continues to gain support from Democrats and independents." 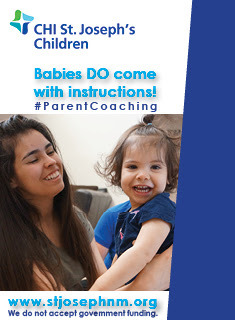 Jose Orozco and Marisol Cardenas said. After the UNM Regents cut off the House Budget and Appropriations Chair and current LFC chair Patty Lundstrom's testimony and were less than hospitable to the 5 D and R legislators during the proceedings, I would suggest that UNM is in for a rough ride in the next legislative session. They didn't help themselves either by rejecting the request from both gubernatorial candidates and the mayor of Albuquerque either. The legislators message was clear. The state has a budget surplus, give them some time to help find a funding solution. The legislature has an extra billion in their checkbook. State government pays almost every salary at UNM. Why wouldn't you agree to work with them on finding a solution? And why in the world would you be insulting and rude to them? What's that strategy? And why are soccer, skiing and beach volleyball paying the consequences for the total mismanagement and corruption at the UNM Athletic department? Best be careful, UNM. That billion dollar surplus has a big line forming. Happy Labor Day, New Mexico! It was the last day to withdraw your candidacy but at the end of Tuesday Republican US Senate nominee Mick Rich was still in the running, crushing the hopes of Libertarian Party nominee and former NM Governor Gary Johnson. His supporters had been pressuring Rich to get out and let Johnson take on Dem US Senator Martin Heinrich man-to-man. Johnson's consolation prize was an endorsement from Kentucky US Senator Rand Paul, a fellow conservative whose father, like Johnson, is a past Libertarian Party presidential nominee. Paul and Johnson share the same small government philosophy but the question on the table after the endorsement was whether Paul would raise big money for an apparently needy Johnson, who this week lent his campaign $100,000 in personal money. I'm not surprised. When I met with Rand Paul, he asked me only two questions: did I support legalized marijuana, and did I support shutting down the government during federal budget negotiations. The early polling has Heinrich ahead in all the surveys. The question seems to be who is going to move definitively into second place--Johnson or Rich--and then make a play at the heavily favored Heinrich, who is seeking a second, six year term. Another withdrawal that was watched for but never came was that of ABQ GOP State Rep. Monica Youngblood. 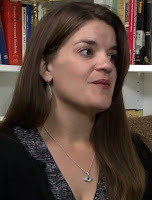 She faces an aggravated DWI charge and some R's had been putting heat on State GOP Chairman Ryan Cangiolosi to force her out and relieve any jeopardy the party faces that her seat could switch to the Dems. It's a fear based in reality. The video of Youngblood's arrest shows her in a very unflattering light. But she's here to stay and it will be up to Dem challenger Karen Bash to take advantage and try to turn a normally R seat her way. Youngblood's trial on aggravated DWI charges is set for mid-September. She needs a favorable outcome to quiet the storm over her arrest and even that may not be enough as she faces not only drunk driving charges but hypocrisy charges. Youngblood has been a leading advocate in Santa Fe for tougher DWI laws. And the wild rumor front was dealt a blow on withdrawal day. 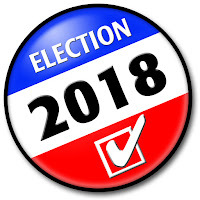 Republican lieutenant Governor nominee Michelle Garcia Holmes did not withdraw from the contest and pave the way for GOP Guv nominee Steve Pearce to persuade his fellow R's to replace her with Dem Jeff Apodaca. Like we said that's a walk-on the wild side and presented by most purveyors of the rumor with tongue firmly in cheek. Jeff lost a bitter Dem Guv primary battle to Michelle Lujan Grisham and his father, former Dem Governor Jerry Apodaca, has officially endorsed Pearce. So with the Light Guv fun out of the way, the rumor mill is now offering up Jeff as a possible honcho for Pearce at the State Investment Council, if Pearce can pull off the upset over MLG. There was a bit of a surprise on withdrawal day when someone actually withdrew. That would be longtime ABQ GOP State Rep. Larry Larrañaga. He said he was getting out because of family health reasons. 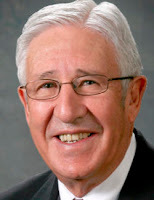 First elected in 1994 and a major player on the House Appropriations Committee, Larrañaga has given the R's just one week to come up with a replacement for the district, all of which is in BernCo. Members of the GOP Central Committee from BernCo are slated to meet and name their replacement September 2. Our Alligators report there is no Larrañaga heir apparent lined up and there is a scramble to fill the post. Meanwhile, Dem contender Bill Pratt, a retired doctor, is hoping that now that there is no incumbent running, he just might have a shot in the GOP stronghold. One GOP name floating is former ABQ State Rep. Teresa Zanetti. As for the 80 year old Larrañaga, who is currently the third longest serving member of the House, he says his legacy is highlighted by the establishment of a rainy day fund to even out fluctuations in state revenue due to oil price boom and busts. He also cites his work on water issues as a lasting contribution. Larrañaga started out as a moderate R in the 90's in the mode of then Senator Pete Domenici but over the years the party has become increasingly conservative. And when the economy crashed as Governor Martinez took over in 2011, Larrañaga and his fellow R's did not make the turn by stimulating the economy or raising revenue but instead continued with austerity and budget cutting. People fled the state; unemployment and poverty rose. Looking in the rearview mirror, that was the political pivot that Larrañaga may come to regret he did not make. Years of massive tax cutting--by both Dems and R's--had caught up with him and the state was starved for revenue. 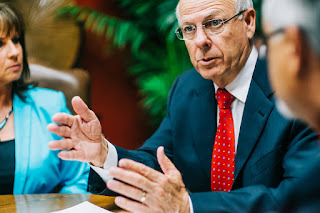 But with a no compromise stance on any tax increases or any other revenue raising measures firmly implanted in the GOP, Larrañaga's moderate past could not be resurrected as it might have been in the time of Domenici. The rest, as they say, is history. Gov. Martinez is in Japan for most of this week, taking part in a National Governors Association trade mission with two other governors. Martinez left on Saturday and will not return to New Mexico until Friday. She plans to take part in NGA-sponsored meetings for several days, and then remain in Japan for two additional days. So go ahead, John, have some fun. Pardon former State Sen. Phil Griego. Fire those cabinet secretaries who have been getting under your skin and then celebrate by treating the staff to pizza and cokes. That's right, John, live it up before you have to live it down. Pearce will capitalize on the new trade agreement between U.S. and Mexico to bring auto manufacturers to New Mexico, The new requirement for auto content made in North America for cars sold in the U.S. has increased from 62.5 percent to 75 percent. The deal requires 40 to 45 percent of content to be made by workers making at least $16 per hour. Mexico has become a significant manufacturer of auto parts and final assembly. New Mexico is poised to capitalize with extensive advantages in rail, space, low cost land, large potential workforce, and a highly favorable location. . . for increased auto production. Well, don't start your engines--or order your borderland Chevy quite yet. The trade pact is tentative and must be approved by both Congress and the Mexican government. And if the Dems take back the House in November that is questionable. If eventually the agreement is approved it is expected to bring more business to the border. Nothing is going to stop the politicians from promising a chicken in every pot or a paycheck every two weeks. Dem Michelle Lujan Grisham is drawing healthy crowds as she kicks off a 33 county "jobs tour" with running mate Howie Morales and other Dem statewide hopefuls. 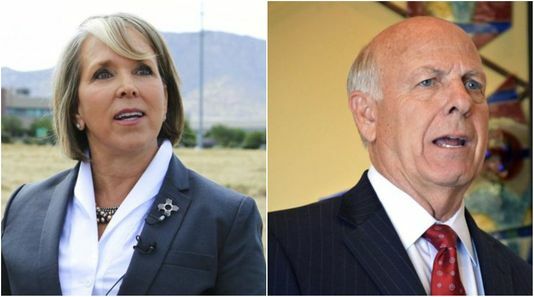 The Dem ticket is pledging to create thousands of jobs in renewable energy, raise the minimum wage to $12 an hour and invest more of the state's Severance Tax Permanent Fund in NM businesses (Pearce is also on board with that last one). Pearce demonstrated a clear lack of understanding of New Mexico’s diversity by insinuating gang involvement among “the minorities” and citing fears that New Mexico could become like El Salvador or Honduras. “It’s crazy that someone running for governor of the state with the highest Hispano population would be so disrespectful . . . His repeated reference to “the minorities” and insinuations of gang involvement are just more of the bias that has threatened and harmed our diverse communities for generations." The Roundtable is demanding an apology from Pearce. But they might have to go through Jerry Apodaca to get it. Las Cruces State Rep. Angelica Rubio posted the Pearce audio in question on her Facebook page. 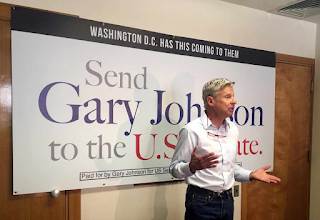 Johnson is committed to going to Washington as a US Senator.. . as a demonstration of that dedication he is putting $100,000 of his own money into his campaign. The pitch goes on to urge the Johnson backers to donate and "quadruple" Gary's personal investment. The good news is that Johnson, who made money in the construction business prior to entering politics, still has a lot of personal cash and is able to put up $100K for his Senate bid. The bad news is that he may need to be putting up his own money because donations are slow. The Majority Institute, a Democratic-affiliated outfit, has released an early-August poll from Greenberg Quinlan Rosner that found Democratic Sen. Martin Heinrich easily prevailing with a 48-33 lead over Republican Mick Rich, while Libertarian Gary Johnson earned 17 percent. Those numbers are very similar to a GBA Strategies internal poll for Heinrich conducted around the same time that had him up 47-29 over Rich, with Johnson at 22, although a Tarrance Group internal poll for Rich in early August had him down just 41-34 and Johnson a distant third at 19 percent. The Emerson College poll begun three days after Johnson made his run official Aug. 14 has him in second place with Heinrich first and Rich last, The results were 39-21-11 and 30 percent undecided. The polls are too close for comfort right now, and our Tea Party opponent has twice as much cash on hand as we do. The last thing our state needs is more failed Republican policies – but unless we act now, we could lose our chance to turn New Mexico blue. So which is it? A comfortable lead for MLG or down to the wire? We'll find out November 6. Steve Pearce turned 71 Friday but there was no surprise party for the '18 GOP gubernatorial nominee. He didn't need one. It's been Pearce throwing a surprise party for the state as his candidacy defies the odds and remains alive as we head into the final two months of the campaign. Democrats are scratching their heads over Pearce. The conservative congressman, often dubbed ultra-conservative, has thus far successfully defined himself as something akin to a moderate Democrat. He's done it through a campaign that focuses relentlessly on jobs as a solution to the state's economic and social crisis which he sums up with one word--poverty--a word rarely heard crossing Republican lips in a state campaign. The message resonates as authentic and simple, qualities that for now bury his right-wing ideology that poisoned his 2008 US Senate bid which he lost in a landslide. 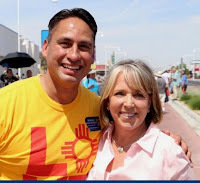 "The "new" Pearce has figured things out and his Dem opponent, Rep. Michelle Lujan Grisham, will now have to effectively unmask Pearce or risk a much closer race than expected. While Pearce has an uncomplicated message, what is coming from Lujan Grisham is more jumbled, an array of messages that focus on various voting groups but with no unifying theme, except, perhaps, her own personality. "Michelle" now appears in large letters at the end of her latest TV spot. The Dems have long seen this race as out of reach for Pearce so MLG has offered soft balls to keep her lead while Pearce pitches across the plate trying for strikes. The quiet center to center right where Lujan Gisham has been resting does little to generate enthusiasm or momentum. The bet is that's the place for her to be with her current single digit lead and with demographics and history weighing heavily in her favor. But sitting still also means you're not moving. Pearce is also getting a break of sorts from a somewhat off-target negative strike financed by the Democratic Governors Association. It's a $275,000 ad buy that tries to paint the southern congressman as a corrupt oil boss. But the charges are old and previously vetted. And why did the DGA not just directly say they did the ad instead of some made up committee that Pearce is now using against them? As we've written, the ad buy in part is meant to preempt corruption charges expected to come from Pearce and the R's over MLG's controversial past ownership role in healthcare firm Delta Consulting. It received state contracts to run the high risk insurance pool. Another owner of the company, ABQ Dem State Rep. Deborah Armstrong, is MLG's former campaign treasurer (recently replaced) and sits on a legislative committee that had a say in Delta. At the least, the optics are damaging. Can Pearce make more hay of this than her primary foes could? GOP consultants believe if he could force the Dem nominee to fumble on Delta and voters bought into the notion that the old right-wing Steve Pearce is really no more, he could squeeze out a win. Pearce has responded to the DGA financed attacks with an ad buy of his own. His campaign says his buy is comparable in size. However, it's telling that the Republican Governors Association has not yet stepped up with an ad buy on behalf of Pearce. While he has surprised over the summer, the insider betting is that the demographics come home to roost after Labor Day and Pearce will be unable to expand much beyond his base. Installing CYFD leadership with real world, hands on management experience in the areas of child protection, abuse investigations, behavioral/mental health, and law enforcement. The culture of allowing problems to remain unaddressed until tragedy strikes must change immediately. That starts with proper experience and tough management at the Department. That swipe at CYFD and the GOP administration that controls it is yet another demonstration of the "new" Pearce who goes where he has to as he works to appeal to constituents--in this case women--who appear solidly behind MLG. (Her comments on CYFD are here). The big picture remains static: MLG is the front-runner and the favorite to win in November. The race remains "Lean Dem." Pearce is not a longshot, however, with a one in three chance seeming a fair assessment based on what he has done so far in a year when national GOP baggage is heavy and after 8 years of a GOP Governor now deeply unpopular. --He was not knocked out. The Emerson College Poll, (right or wrong and we've written critically of it), has Pearce trailing by only two points, 42-40, helping him with fund-raising and voter perception. --The Apodacas. Former Gov. Jerry Apodaca endorsed Pearce and his son Jeff continues to give MLG trouble on the trail. That gives Pearce some street cred with Hispanic Dems who have rejected him. Of course he will need a lot more. --The aforementioned DGA attacks came because the Dems fear the corruption charges that have been leveled against MLG over her role in Delta Consulting. It's a defensive play. By this stage you would have expected the DGA to be presenting Pearce's conservative record as Loony Tunes. That will still come but Delta gave Pearce more time to continue as a "moderate" even if sustaining some mild damage from the DGA attack. --In August, Pearce continued to promise something concrete to voters--jobs. That's a top two issue (along with education) in the state, according to polling. The MLG message continues to be less tangible and, most important, less compelling. MLG supporters dismiss this as hogwash, saying the insider polling shows her moving and that Pearce is now in panic mode. Maybe. So. . .
Has Pearce, who would be the oldest person elected Governor in state history, peaked? Is his summer of fun about to turn into a Fall from grace? Dems think so but have learned that he isn't going to fall by himself. It's going to take a push. That jobs message Pearce is hammering is traditional Dem territory and MLG and her running mate Howie Morales are getting back on it as they launch a jobs tour to all 33 counties of the state. Howie Morales and I are starting our Jobs and Leadership Bus Tour to talk to voters from all 33 counties in New Mexico about our plans to create good-paying jobs, boost our economy, and expand our clean energy sector. Find an event near you here. The GOP lieutenant Governor candidate, Michelle Garcia Holmes, is also on the campaign trail. Here she is in Hatch pictured with its famous chile in the middle of harvest season. In New Mexico it's hard to go wrong with those colors.